A great thing about this homemade cranberry sauce is that you can make it a day ahead, chill it in the fridge and serve. Score! I love this recipe because it uses fresh cranberries and it has a tartness that gives a nice hint of fresh orange zest. It’s so, so much better than the cranberry-colored stuff that comes in a can. I mean, who wants to eat a gelatinous blob that slurps out of a can and maintains the exact cylindrical shape of the container in which it was packed last year? Once the sauce thickens, I use a potato masher to break the cranberry skins and release the amazingly fleshy insides, giving the sauce a wonderful texture and thickness. You easily can adjust the amount of sugar to your taste or diet. To balance out the natural tartness of the cranberries, I recommend a half cup of sugar … any less and you’ll be puckering pretty severely (which of course works out fine if you have a good supply of mistletoe handy). This homemade cranberry sauce is going to turn you into a holiday hero. 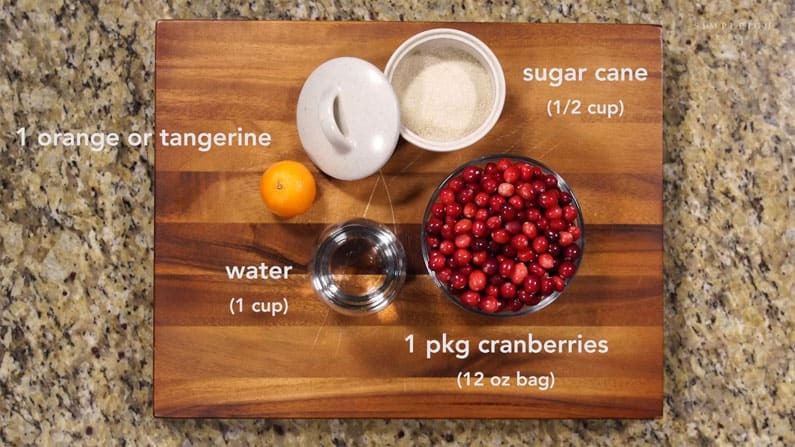 In a medium saucepan, combine cranberries with water, sugar, orange zest and juice. Cook over medium heat, stirring to dissolve sugar. Bring to a boil; reduce heat and let simmer until sauce has thickened, about 15 minutes. Let cool completely before serving as your holiday hero. looks more than delicious! I will have to try it!